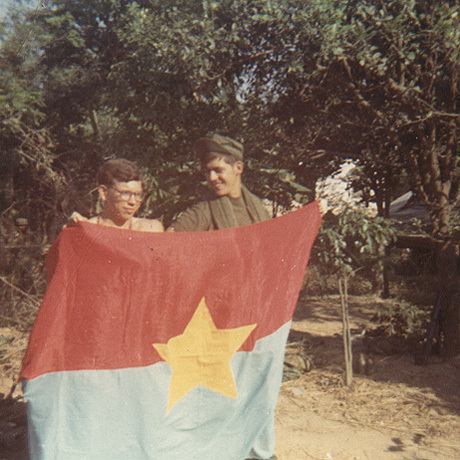 Rick “Doc” Doggett, left, and John “Crazy” Sigouin hold a Viet Cong flag captured by CAP 2-7-2 in a firefight on May 8, 1970. The article below is from the U.S. Army’s 9th Division newspaper. It explains the history of the flag and its symbolism. equal parts with a five-point star in the middle. moving clockwise represent farmers, industrialists, merchants and soldiers.